Insidious is the quirky demon-child birthed by the creators of Paranormal Activity and Saw. Bound to be the most popular horror film of 2011, it is an unexpectedly, yet terrifyingly, effective mix of horror, fantasy and supernatural science fiction. Dalton Lambert (Ty Simpkins) is an adventurous boy with an affinity for astral projection. His spirit, however, ventures too far into an otherworldly region called 'The Further' and, consequently, is imprisoned by a 'Lipstick-face Demon' (Joseph Bishara) that wishes to possess the boy's spiritless comatose body. Luckily, this skill of astral projection is passed down the Lambert line and a heroic family member (it's obvious who it is) must conquer his/her childhood fears to rescue Dalton, assisted by medium Elise (Lin Shaye). 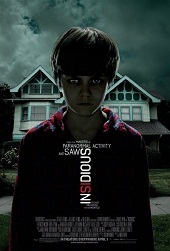 Directed by Australian James Wan, Insidious is a suspenseful opus from the outset. The title sequence is an eerie black-and-white montage of haunted domestic scenarios: a kitchen chair that moves on its own, a ghostly face at the window, a tall shadow standing by the curtains. Tinted to appear like a 70s/80s film, Insidious is highly intertextual, making references to past works of horror while creating a refreshing plotline of its own. There is even a nod to the Three Men and a Baby hoax, as the viewer is quick to spot a ghost boy in the foreground as Dalton's mother, Renai (Rose Byrne), casually walks past it. Also, a moment of self-reflexive humour is seen on the blackboard, with a chalk drawing of the iconic Jigsaw mask from Saw. The frightening soundtrack easily manipulates the viewers' senses and is almost a character of its own. Composed by Bishara himself, the music and sound effects have been attentively handled and include the amplification of everyday noises as well as reverberating Herrmann-esque dissonant strings. Two of the film's scariest scenes â€“ a 'burglar alarm' scene and a SÃ©ance â€“ owe much to the score for their effect. Also, the film's use of Tiny Tim's spine-tingling 'Tiptoe through the Tulips' is memorable and makes The Four Freshmen's 'Jeepers Creepers' sound like a nursery rhyme. It's a relief to know that Insidious has a secular and, hence, more inclusive view of spirituality and is not dominated by esoteric religious ideas as seen in the countless exorcist-themed films. Also, it's great to see mediums actually resolve supernatural situations. Shaye (the super-tanned woman from Something About Mary) as Elise is effortlessly hopeful and radiant. The film's Australian cast is also impressive. Saw writer Leigh Whannell is cast alongside Angus Sampson (Footy Legends, 'Thank God You're Here') as Specs and Tucker, the geeky ghost-hunting duo. These comic relief characters are much welcomed to break the film's tension. Also, Byrne is engaging as the struggling songwriter and multitasking stay-at-home mother. In terms of narrative, Insidious does have a few logical flaws. Firstly, it is quite silly to move out of a haunted house without asking neighbours about the experiences of the previous occupants. Also, Byrne does underact at times, especially when her younger son tells her that he sees Dalton walk around at night. In addition, the conclusion is somewhat disappointing, as it doesn't deviate from horror conventions. However, the fact that the film manages to constantly keep viewers clamping their lips or holding their breath to stop themselves from screaming is noteworthy, and is more than enough to make up for the film's faults. As with Saw, you will definitely be grateful for being alive after watching Insidious. Just be sure not to watch it alone!